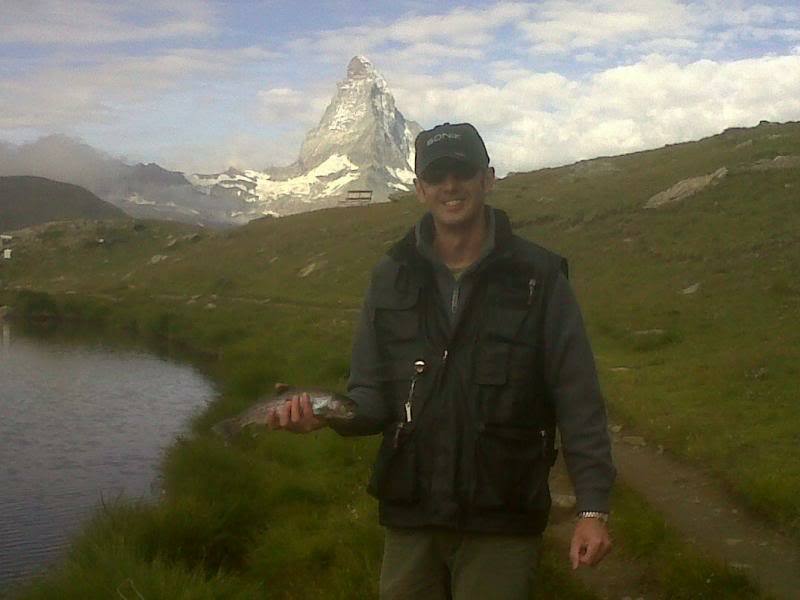 I was on hols in Zermatt, Switzerland recently and 'happened' upon an opportunity to do a bit of fly fishing! So a spot of fishing it was then .. I gave Kirk a call and booked a day's fishing. 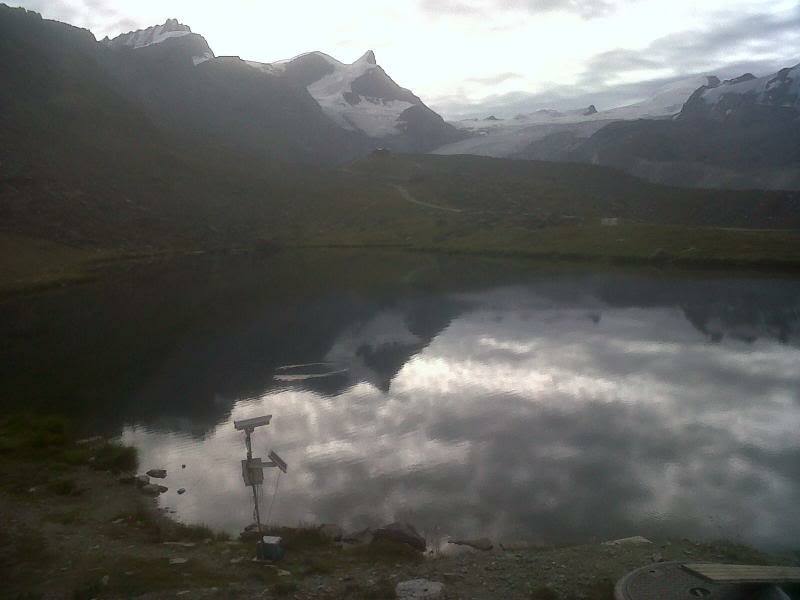 The lake is up in the mountains - while Zermatt village is at 1600m, the lake is at 2600m altitude. To get there is a trip up the ski lift and then a 20 minute hike. As we arrived (about 9am, we started out at 8am) there was no wind, the lake was flat calm, and fish were rising all across it, despite the light being fairly bright. We rigged up (the gear was provided - Sonik sk4 / sk8 etc, 5wt) and Kirk recommended that I fish a dry - a sedge imitation. It worked straight away - first cast I was into a hard fighting trout, taken off the top. and the good sport continued - I had about 6 further fish that morning. The story behind the lake is that the trout were stocked by the nearby mountain restaurant about 20 years ago, for eating, but were never taken out and have bred there since. The lake (obviously) has a long winter, covered in 2ft thick ice, and the water remains cool even in high summer. Aside from the spectacular scenery and environment in which we were fishing, the other weird thing were the number of spectators: the mountains are fairly busy with hikers and it seemed that every time I was into a fish, I had about a dozen people watching and landing the fish was met with ripples of applause! Lunch followed at the nearby restaurant (plenty of beer ) and then with an increasing wind, we called it a day. 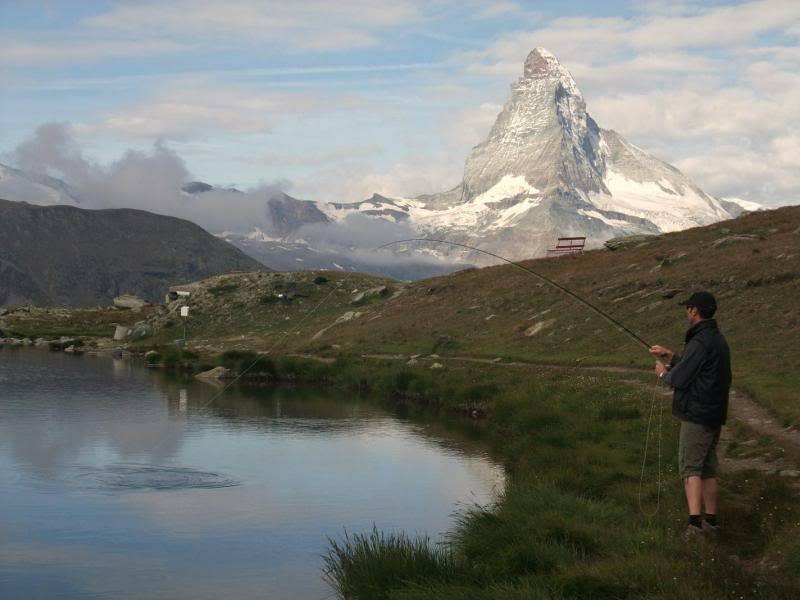 Who would have thought you could catch trout at the foot of the Matterhorn? (well almost!). Nice pic! What is that in the foreground? Looks like CCTV!